Kinda what I was thinking! Well season is only 32 days away ( my count down counts today is a day) so really 31 so close!! I too have a few good looking bucks. I went up to the lease last week. 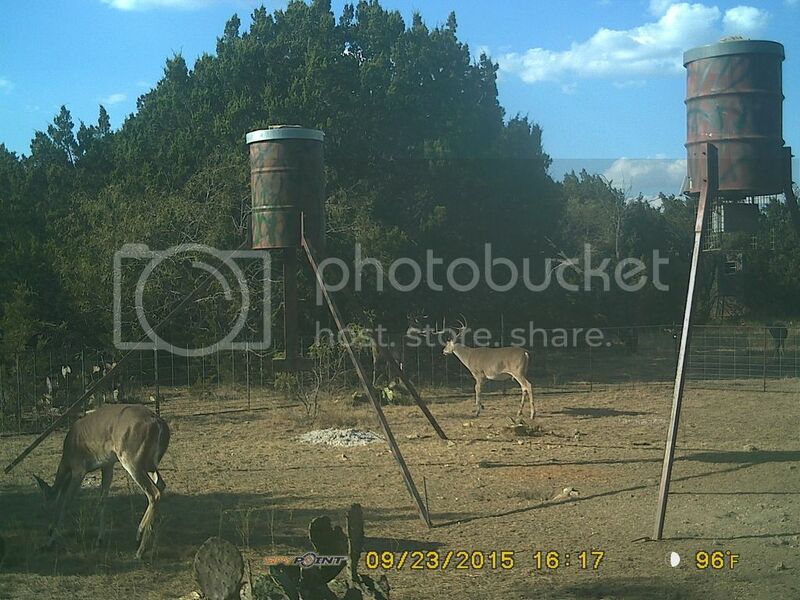 Deer are hitting feeders hard. So are the pigs and turkeys. Season looking good. Good luck to everyone. Dusty takes care of our protein and corn feeders as well...we are between Bend and Cherokee. Get any rain up there today? Our place is about 10 miles north of Lampasas off 281. Sure could use it. Still dry out there. Big cracks in the ground. Went out there Saturday and scouted a couple spots. It had rained enough to knock the dust down on the county road in the morning but thats about it. 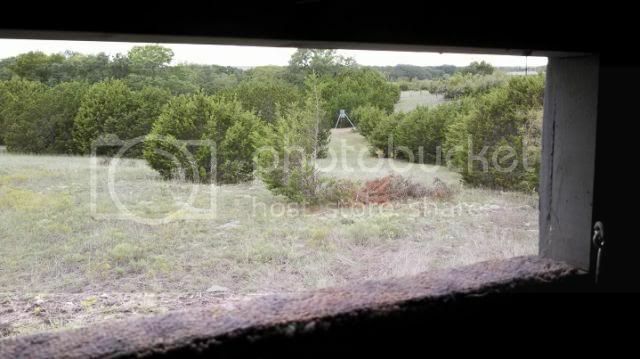 As for the deer, this was the first time I have been able to sit and scout. We have only been on this place for the past 2 months and it was in rough shape when we first got it. 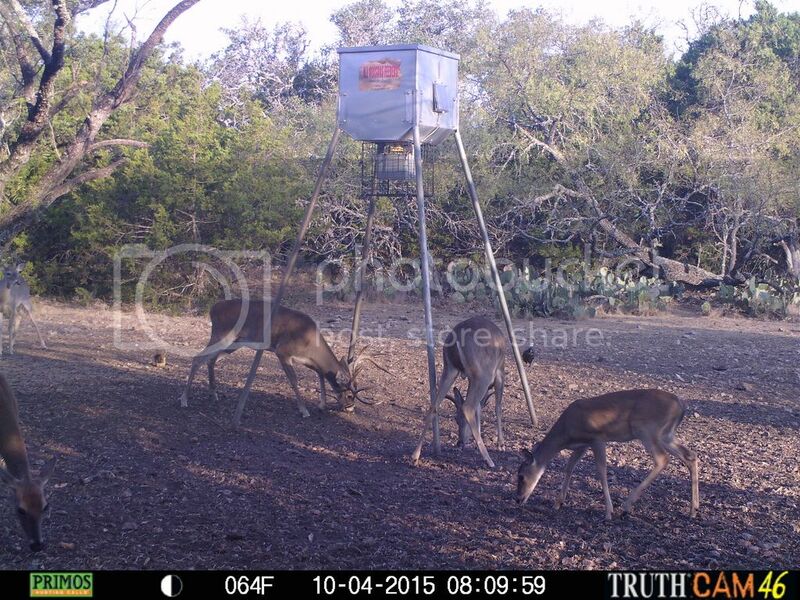 So far nothing but young deer but I think both of these deer have potential. Few miles north of Adamsville. Saw a shooter 9 Labor day weekend. Missing a lot of bucks that I'm positive made it through last year. Dads feeder below will get a pen next year similar to mine above. That pen went up Labor day, now hogs and cows are no longer an issue. 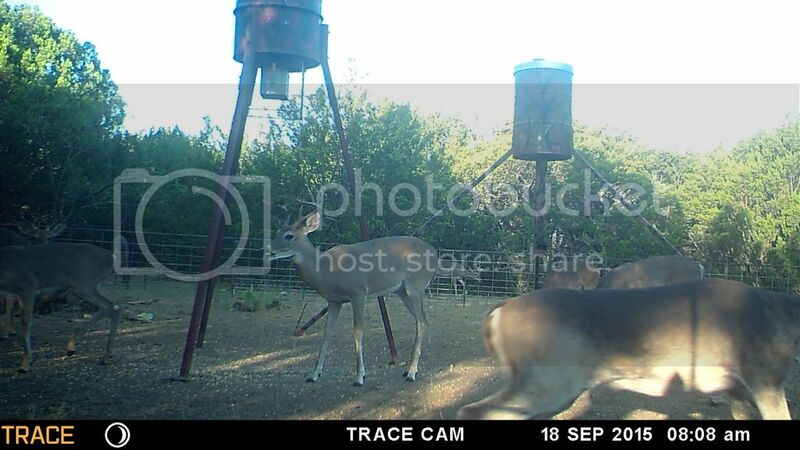 My parents just got a new place in Lometa so, this will be our first year hunting it. Have a couple decent 8's on camera. One that'll probably get double lunged this weekend. Other than that, our pond is drying up and looks like we could use some serious rain. 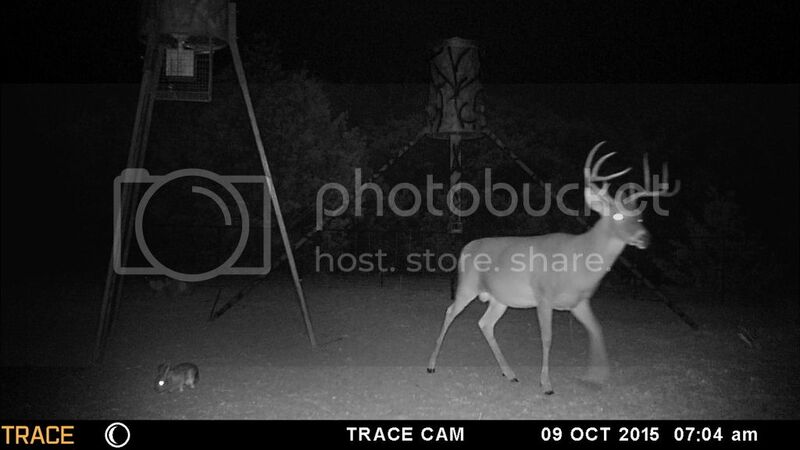 What caliber of bucks should I expect to see this year? just a reminder. lampasas county is very dry and crisp right now. So be careful with the outside fires and where you park your trucks. Try to avoid parking over tall grass. Thanks for the reminder! It is extremely dry there. Be safe and good luck to everyone! Well...I have a good 10 coming in almost every day.and only 3 days away 😃 good luck again. And stay safe!!!!!!!!! Woooohooooo!!! Headed south in the morning!!! Pumped!!! Mathewsmission sent you a pm. Any one put something on the ground yet? Not what I was after. Had 11 bucks on their way in and these little bull dozers showed up. Blew all my dear out so I shot a boar and a sow. 5 minutes into opening morning. 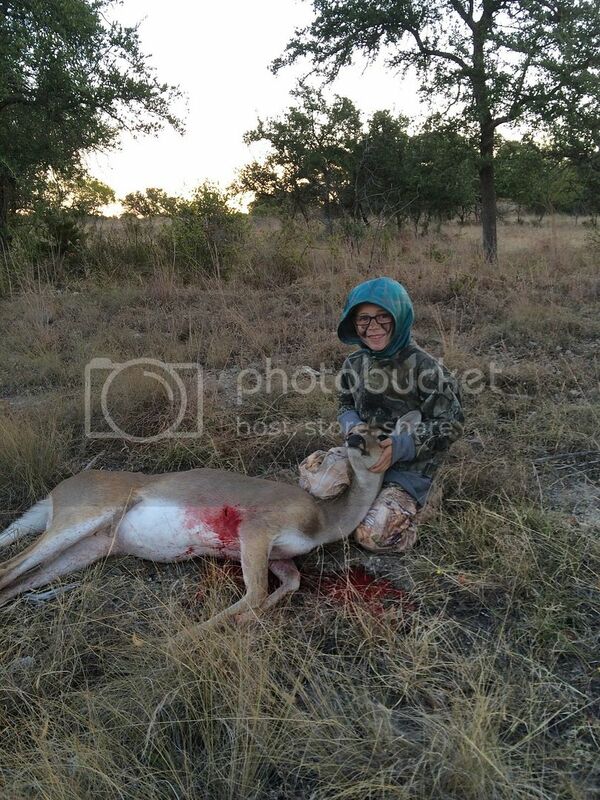 Nice doe. Not seeing many of those. if anyone knows about any leases available in the area for next year pm me please! We are covered up in doe. The guys on our lease don't shoot them so my plan is to tag out. Then take the kids down during the extended season and let them smack a couple each. I shot a nice 10 point with the Hoyt Sunday morning in Lometa. I would post pictures but I can't seem to figure out how. 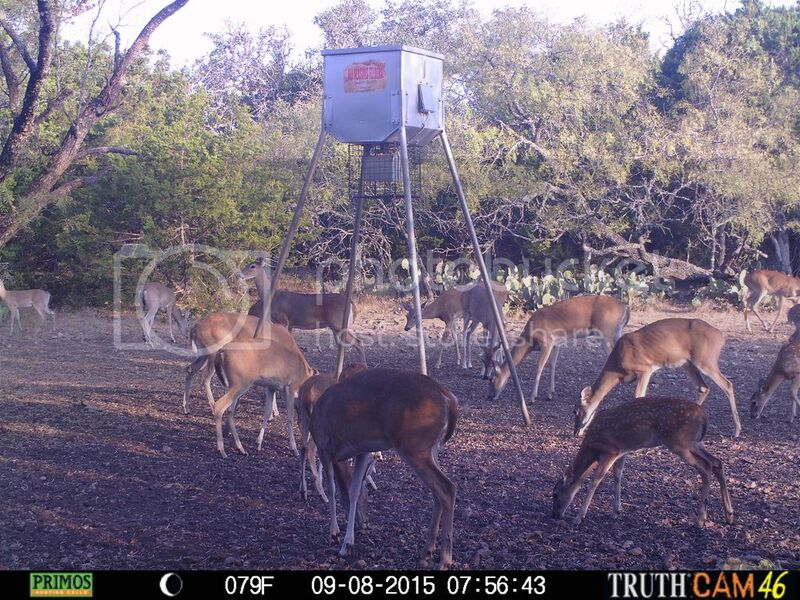 Bucks are all bachelored up and the doe are plentiful. 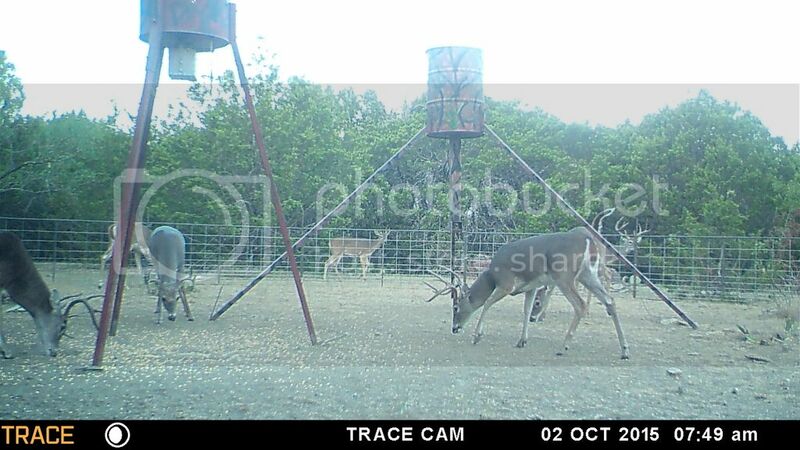 I have not seen anything I would consider an old, mature buck on camera or in the field yet and I am trying to figure out if this is due to the fact that not many people let good, young deer go around the area or if they just get popped at a young age. Little late but Dad took a nice 10 Saturday morning. 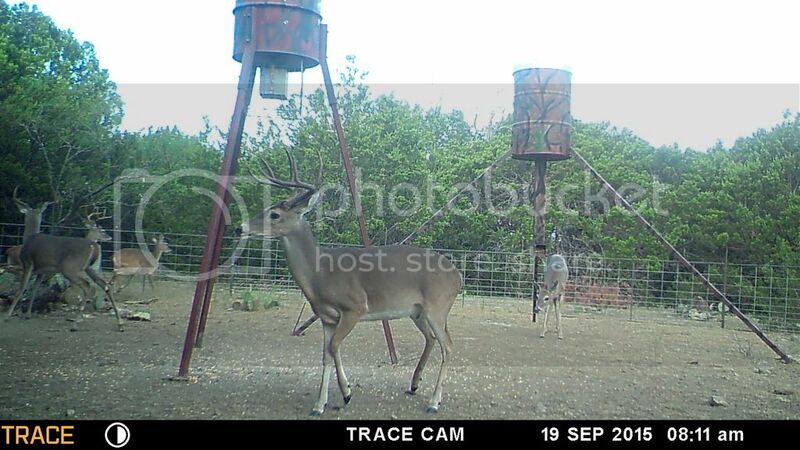 We have a lot of good camera pics of bucks still in the area and one very large aoudad. 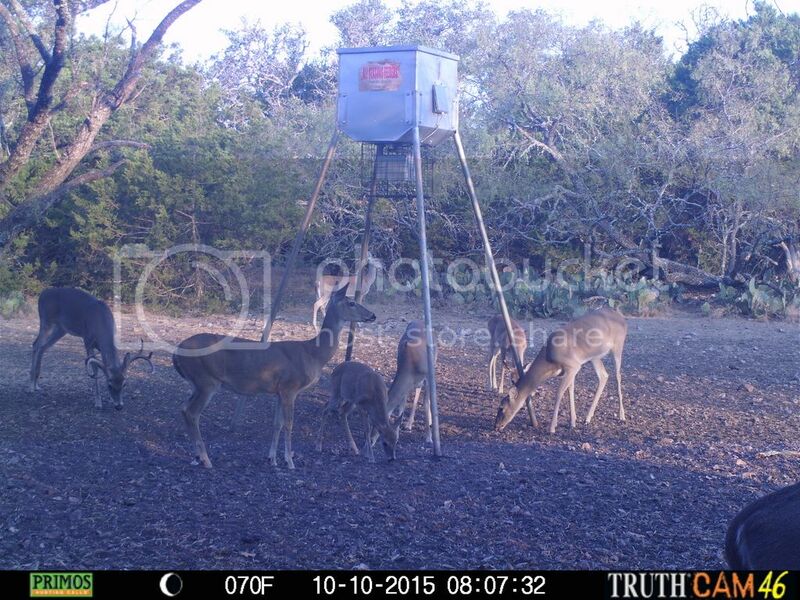 Very few doe showing up at the feeders. We're here 3 miles S of Evant. Just gun hunting this year, but we have a couple of BIG fat does coming to the feeder when it goes off at sunrise every morning. Going to have a bunch of venison sausage in the freezer this winter! Last edited by Ruark; 10-06-2015 at 02:40 PM. what part of Lampasas county are you in ??? Aoudad would be cool! I have seen a few Axis in the past and a blackbuck doe 6 years ago. We are off CR 2600 so, not too far from you. We are across the river from Colorado Bend. Been showing up the last couple seasons. Haven't seen any Axis yet. Really hoping to get a chance at one some day. Last edited by HillCoBowHunter; 10-07-2015 at 03:27 PM. Finally figured out how to get pics on here. Great job man. 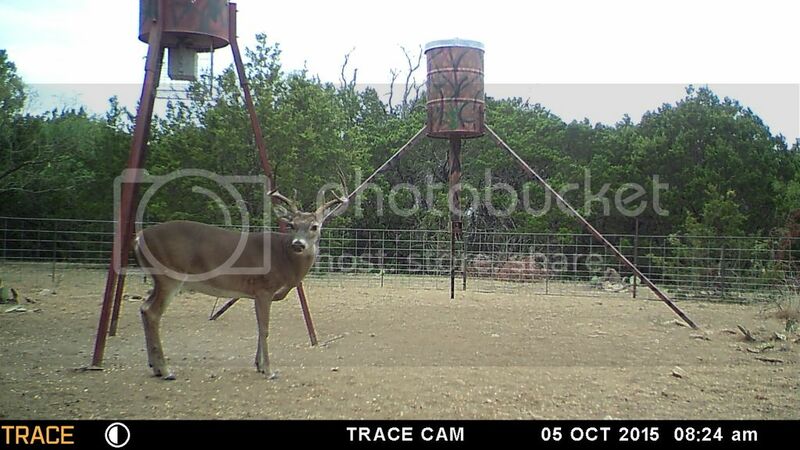 Cool buck and you've got a nice setup there. Beautiful piece of property. but I know that is not very realistic thinking. I dropped this guy on Saturday morning. 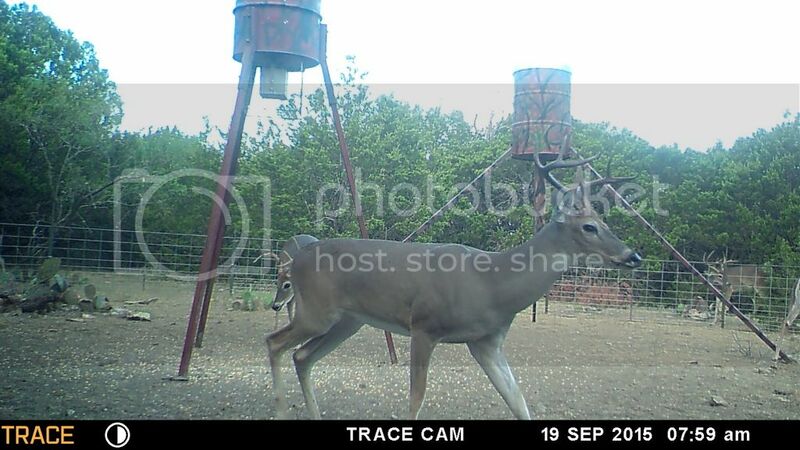 He was #1 on my hit list. I've been watching him for 3 years. Couldn't be happier!! See link below for details. Congrats everyone. Those are some nice deer. I really like that Big 8! 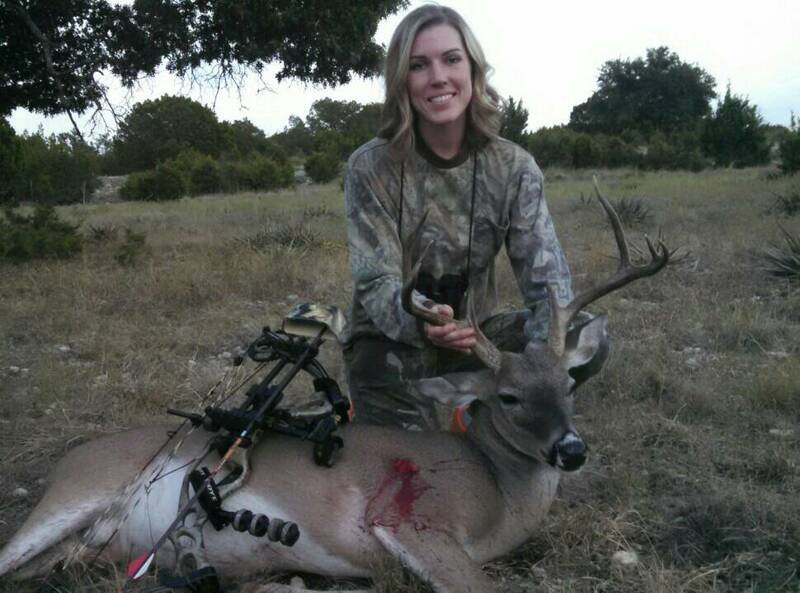 My wife shot a nice mature buck and a doe Sunday the 4th. She tells me to stay home and watch the kids and brings home the goods. That big 8 looks very mature to me. 5.5 yo at minimum. Agreed. A mature 8pt of that caliber has got to go. Anyone seen any rut activity in kempner? I saw 2 bucks fighting Sunday afternoon!! And my dads co-worker saw to bucks fighting in Adamsville. The rut is heating up!! been seeing them spar, but not fight. Right now the only fighting would be over who is dominant in the feed pen.. I shot this one opening morning at 0820. 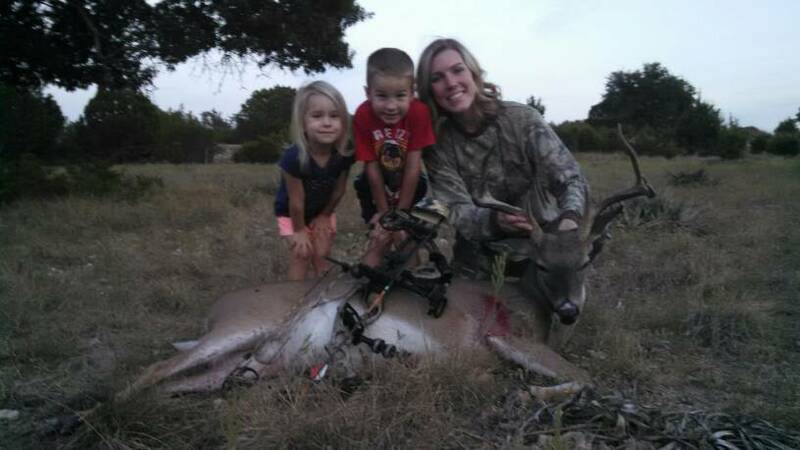 I had the wife and my youngest son in the stand with me. It was great having them with me. I wish I could figure out how to post more than one pic at a time. Sorry for multiple posts. 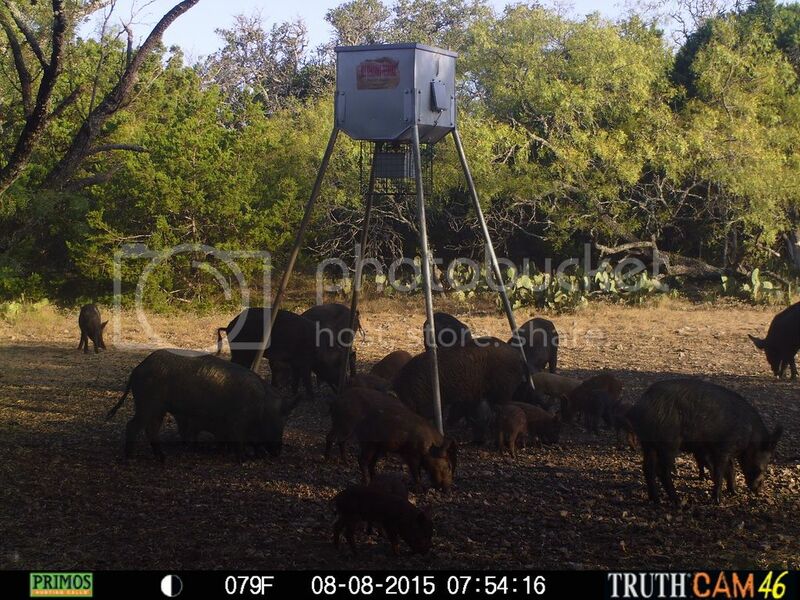 We hunt about 10 miles north of Lampasas near School Creek.